The best meat slicers are found in commercial restaurants than in the home, but they can be wonderful to have in your home. There are many choices, whether you’re looking for a commercial meat slicer or one designed for home use, you’re sure to find something that will fit your needs and desires. Find the best home deli slicer reviews on Amazon in 2019. Of course, when you’re making your decision, you’ll need to consider how much meat you’re planning on slicing. On the other hand, slicing meat is not the only use for meat slicers. You can also use them to slice veggies or even cheeses. Plus, if you have a meat slicer at home, you can purchase your deli meat in bulk and slice it as you need it. When you’re considering purchasing a meat slicer, you should think about your slicing choices, the size of the blades, the horsepower of the machine, and the safety features it comes equipped with. The 823E from Berkel meat slicer is an excellent choice for restaurants, especially if you’re planning to slice meat numerous times every day. Additionally, this unit has many safety features, which makes it excellent for a restaurant that has many employees buzzing about. Additionally, it is only about 15 ¼ inches wide x 18 ¾ inches deep x 13 ½ inches high, so it won’t take up much of your counter space. This meat slicer is a professional one and has the ability to slice veggies and cheeses- not just meats. The blade is 9 inches long and can slice through veggies and cheeses up to 7 1/8 inches wide and 9/16 inches thick. Finally, the 823E from Berkel also has a built in blade sharpener on top and a flexible 6 foot cord, so you can locate it farther from the electrical outlet if you need to. There is only one speed on the 823E from Berkel. The 615A from Chef’s Choice meat slicer is the perfect meat slicer for the home and will even work well for smaller restaurants that don’t do much food slicing throughout the day. 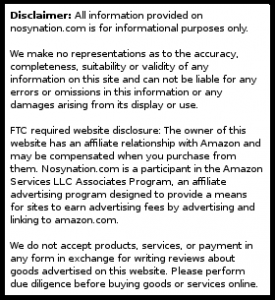 This model comes with a few safety features, as well as a one-year warranty from the manufacturer. 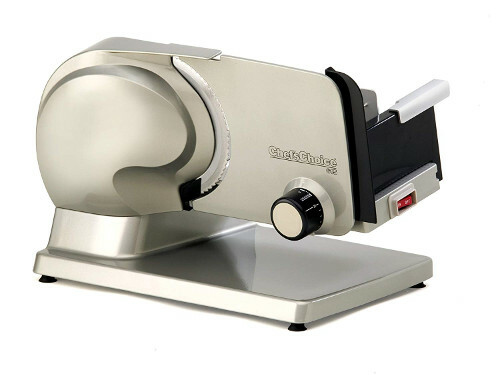 This meat slicer also slices more than just meat- it will slice through veggies, cheeses, and even breads. 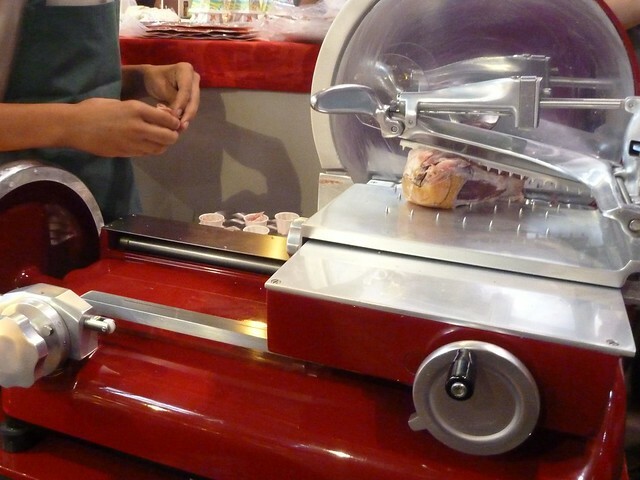 The tilted food carriage allows you to slice your meat precisely and efficiently. The meat slicer from Chef’s Choice only has a 7 inch blade, which is actually a bit small for these types of machines, but really does work well for home use and for smaller restaurants. This slicer will slice meats in a variety of thicknesses, from deli thin to ¾ inches thick. The blade is made from stainless steel, which means that it’s will resist rust over time. You can take the unit apart, removing the blade, the food carriage, food pusher, and food deflector to make cleaning your machine much easier. 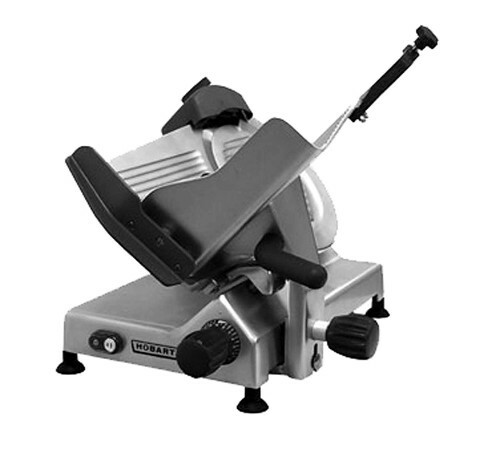 The Hobart Edge-12 is another of the professional-grade meat slicers. This slicer can handle the constant slicing that restaurants require. Plus, it has many safety features so you can leave it on a countertop in your restaurant, even if you have lots of employees in and out of the kitchen. Plus, it is easy to disassemble, which makes cleaning easy. The base of the unit is a single piece, which means that juices won’t seep into cracks and crevices and cause bacteria or mold to grow where you can’t clean. The Hobart Edge-12 is made to handle large pieces of meat and can slice meats up to 9/16 inches thick. The carriage will hold food up to 10 inches wide and 7 ½ inches tall. You can run this machine for up to six hours per day. Due to the fact that it was built for a professional setting, it has a Poly-V belt drive system, giving it quiet operation so that you don’t have to worry about your restaurant patrons being disturbed. The knife on this unit is 12 inches long and is chrome-plated carbon steel which will resist rust and damage over the years.. 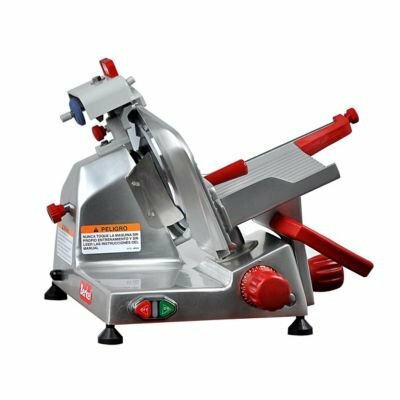 If you are planning to purchase a commercial meat slicer for your restaurant or other commercial use, and multiple people will be using it, you should likely go with the first one due to the fact that it takes up less space and has a wide range of uses. On the other hand, if you’re looking for something home meat slicer, consider the Chef’s Choice. It is easy to use and has a variety of uses. However, if you have a very busy restaurant, it’s best to go with the third one due to the fact that it is a more professional unit and is easy to tear down for cleaning (and put back together). Find the best meat slicer under $100 on Amazon in 2019. Next articleHow Many Strings does a Guitar Have?